When I first changed my diet six years ago, not many people knew about real food. It was hard to find any real food restaurants and difficult to buy, even living in a city as global as New York City. My friends thought I was weird (many still do!) and through my farm buying club the only other people I met who were also on a real food diet were twice my age. Slowly as the years went by, more and more restaurants started popping up; since leaving New York, the few that I used to go to regularly are now in competition with many new ones (so much so that I can’t keep up despite my frequent visits, though none are 100 percent real food like BM Organics Market was.). When I moved to Miami I met two other girls my age who were also on a real food diet (a miracle!) and slowly more and more of my friends are starting to catch onto real food and changing the way they eat. I see major brands in supermarkets, where it was once impossible to find non-GMO food, pastured meat and grass-fed fed butter or milk (pasteurised—raw is illegal in most of the U.S.) marketing their products with ‘grass–fed’, ‘pastured’ or ‘non–GMO Project‘ labels. I also am seeing many articles written in the mainstream media disproving the notion that fat and cholesterol are bad for our health. The movement is gaining speed at a tremendous rate and hopefully we will win the fight against companies such as Monsanto and their genetically modified organisms and we will see the day when real food restaurants and cafés become regular sightings on the street, replacing fast food restaurants (or restaurants trying to be healthy but who have got it all wrong by thinking low-fat is the way to go) and the health crisis in America and many other countries will come to an end. 3. 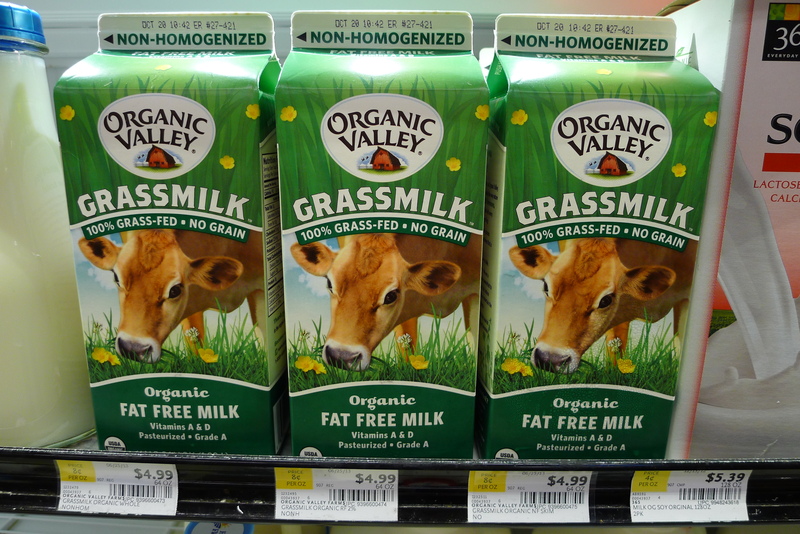 Organic Valley now sells 100 percent grass-fed, non-homogenised, pasteurised milk. Although I don’t agree with fat-free (pictured above) or pasteurised, it is a huge step in the right direction. They also make pastured butter which can be found in many supermarkets. I use this kind for cooking with instead of raw pastured butter. As the beneficial enzymes have already been destroyed from the heat of pasteurisation, which also happens when it is cooked, I don’t like to waste my expensive raw butter for cooking. I am still getting the high levels of omega-3 fats and CLA (conjugated linoleic acid) which are present in pasture-raised animals.